Natural radionuclides of 238U (226Ra), 232Th and 40K maintained in the earth crust (soil) of Archaeological Site (Tanis, San Al-Hagar, Sharqai, Egypt) were measured using γ-ray spectroscopy system equipped with High pure germanium detector (HPGe). 20 soil samples were collected from the ground surface of tomb rooms, roads among tombs and the outer empty space of Tanis. Arithmetic mean value of radionuclides concentrations in the studied samples were 5.96 ± 1.46 Bq kg-1 for 226Ra, 3.78 ± 1.60 Bq kg-1 for 232Th and 70.34 ± 7.20 Bq kg-1 for 40K, respectively. All the studied natural radionuclides had concentrations values less than worldwide recommended value of 35, 30, 400 Bq kg-1 for 226Ra, 232Th and 40K, respectively. Furthermore, the radiation dose in that site was measured using Digilert100 radiation survey meter and its mean value was of 0.52 ± 0.13 μSv h-1 which much lower than safety limit. 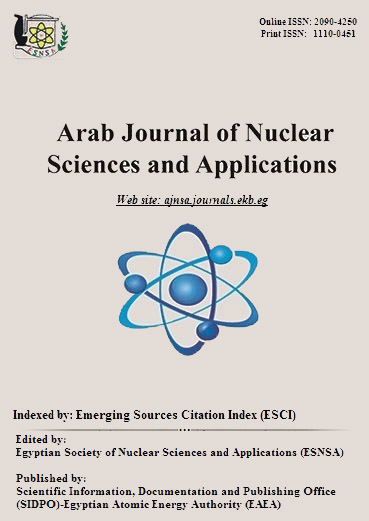 Moreover, Radiological hazards indices of radium equivalent activity (Raeq), external (Hex) and internal hazard indices (Hin), alpha and gamma radiation indices and annual effective dose due to the presence of those radionuclides were calculated and had values less than worldwide limit. These results implied that the Tourists can safely visit and stay in this site (San Al-Hagar) as much as they want.